I usually set the next un-stitched canvas I want to stitch out on stretcher bars so I can look at it as I finish stitching the last one. This usually gives me incentive to finish a canvas and not dawdle; but sometimes (usually) I get ahead of myself and stick the new canvas audition out to soon and it frustrates me that the canvas I am working on is stitching so slowly. This is one of those pieces that had many side stories to it, or maybe it is just insight into my crazy thinking. At any rate, I will try and explain as we go…I am going to walk you through MY processing. It takes some turns and twists…so let’s get started. This canvas is painted on three separate pieces of canvas for easy of handling; so I have three canvases framed up and I am going to start the bird’s bodies first. This Melissa Shirley (http://melissashirleydesigns.com//) canvas is another guild member’s canvas (Remember if you like this canvas ask your shop to see if the canvas is still available.) She loved birds and stitched many of them…I have a couple turkeys she stitched but this was one that spoke to me, so I brought it home. 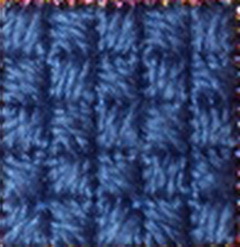 I knew I wanted all the squares to be the same stitch: middle blue square are Reversing Scotch, lightest blue squares are Milanese; and dark blue squares are Byzantine. The yellow bars are Slanted Gobelin and the little squares would be Smyrna Crosses. I had even decided to stitch the bird in Brown Paper Packages’ Silk n Ivory (http://www.brownpaperpackages.com/). (1st twist). 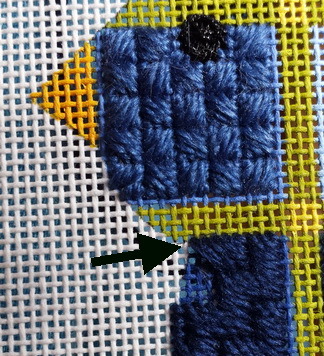 Yes, I know some stitchers think Silk & Ivory pills on 18 count canvas and it may; but I have never had this problem. 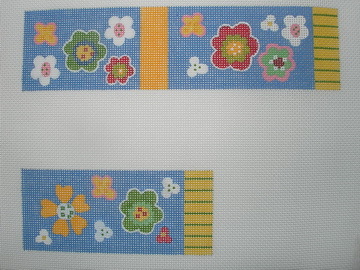 I think if you are stitching something that is going to get a lot of wear (belts, purses, etc. ); Yes, then you should think about using another thread. But remember any thread on a wearable garment will wear: perle cotton will lose its luster as will silk pearls, floss will not hold up to constant wear, and wool will pill too. So in my opinion, you should use what you like. Wearable stitching is not for a lifetime in most cases. Using Silk and Ivory on 18 count ornaments, standups and other decorative pieces works for me and I use it. The only problem I have ever encountered over the years is that large area of Silk and Ivory stitched in Basketweave tend to be tight (but I did it on this piece as you will see), but I have very little or no problem with decorative stitches. I do us a size 22 needle when stitching with Silk and Ivory, I think the larger needle opens the wholes of the canvas a tad more and helps the thread move smoothly through the canvas. I don’t know why I picked a center square to start must have been Stitching Angel intervention, but somewhere I got it in my head these were not perfect squares. 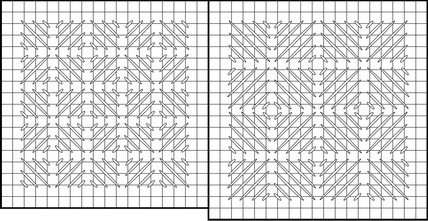 They are 16 threads to each square separated by 3 threads. 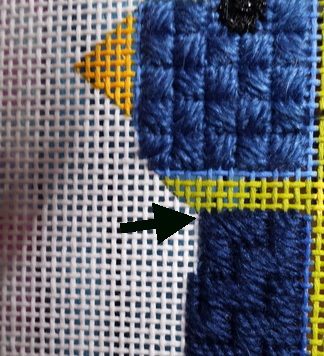 But I made a mistake and stitched the Reversing Scotch Stitches over three threads instead of four. 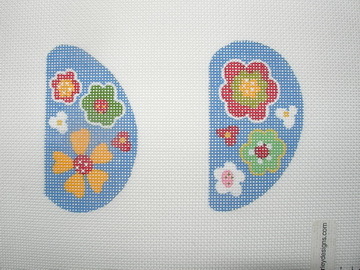 I could have taken it out but for whatever reason (I hate Frog stitching) I kept going. 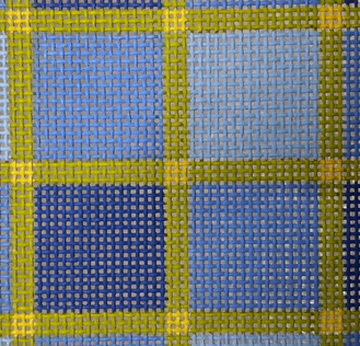 I assumed the squares were off, but if I added a fourth thread to the dividers I could continue…I later went back and charted the Reversing Scotch and I liked my mistake better, so I kept it. After I played around and decided this mistake would work there was another twist: I have decided to change some of the threads. 3rd twist: A few years ago I discovered Copic pens (http://www.copiccolor.com and http://www.copiccolor.com/) and now I can’t get enough of them. While playing with the Copic pens and an air gun I realized I could color areas of white canvas to simulate any color canvas I could want to purchase…hummm…but that’s another story. 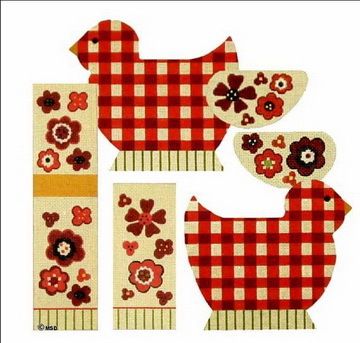 But I have used them to color canvas backgrounds if I need a larger or different shaped background. I wonder if I can change the color too? So I stopped stitching and changed all the yellow to sorta pink so I could use the Kreinik Confetti Fuchsia. 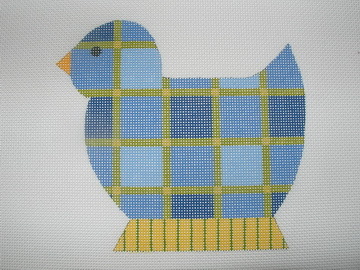 So for now I am stitching along on the blue bird bodies…I will be back with the sides and wings soon. .